One nice thing about having a website like Airplanes and Rockets is that every once in a while a famous person will contact me with some great information. 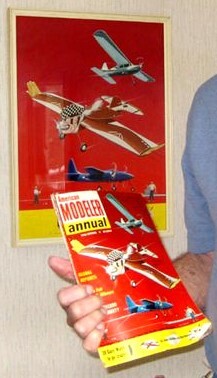 It happened again recently when David J. Holland wrote about how he still has the original artwork of his "Flying Men" models from the cover of the 1962 Annual Edition of American Modeler. He sent a photo of the magazine cover next to the framed original, along with a photo of his actual control line model. Says Dave, "The picture is of a magazine cover and article about my funny face models in the '50s and early 1960s. The model pictured is the third version as I wore out the first two. The story and cover were the result of a demonstration flight I did during the Sunday air show at the 1961 Nationals at the Willow Grove, PA naval air station. I have the original art work of the cover, four times the size of the magazine." Dave's story prompted me to obtain a copy of the 1962 American Model Annual Edition in order to have the original article that went along with it. It is now part of my magazine collection that is available for article copy requests. Where do these awesome creatures come from? Cal Smith sez that only Dave [J.] Holland knows! It's a bird!-It's a plane! - No, it's the Flying Man! Take one Sterling Ringmaster kit, add a liberal helping of ingenuity, a real kookie paint job, mix well and behold-the Flying Man. This is the formula developed by Dave Holland of Elyria, Ohio, in creating his series of Flying Man models. 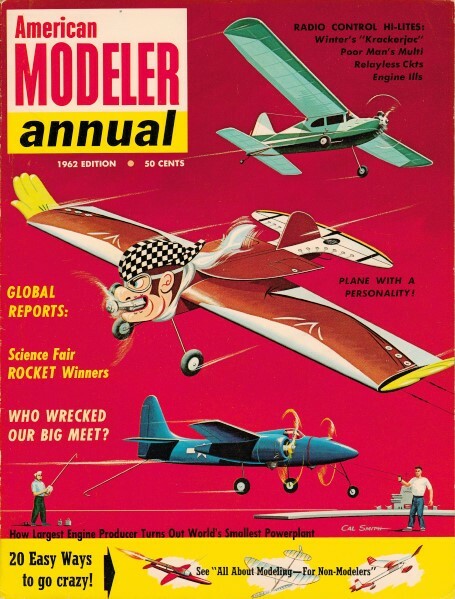 American Modeler readers will recall Dave's "Skydiver" "Uncle Sam" and "Dennis-the-Menace" (Dec. 1959, April 1960, May 1961 issues). There is also a "Yogi Bear" now flying around Ohio. These Flying Man models are different, make no mistake, Not only do the novel paint jobs set these models apart from the average stunt ship, they are also capable of some unusual flight performance. With a K&B Torpedo 29 turning a 9D-6P Nylon prop the models can do the Saber Dance, hanging vertical and virtually motionless on the end of the flying lines, without benefit of engine throttle control. Dave advises that in a single flight his crates can make VTO's and landings. They can hang on their prop anywhere from one inch to thirty-five foot altitude. They will perform like a helicopter, flying slowly around the circle in a vertical position. The jobs will also do most of the stunt pattern. Dave reports he can play tag with his son Randy. Randy also assists in making hand-held VTO's and pick-it-out-of-the-air retrieves at the end of flights. THIS ARTWORK IS FOR SALE! Please contact David if you are interested in purchasing the original cover artwork. The Skydiver Flying Man has been flown for over four years, logged over 1000 flights, used up thirty gallons of fuel. Landing gear and control system were replaced along the way after the original equipment wore out. But the original Torp 29 is still in use. Skydiver has won eight trophies and mucho merchandise in balloon-breaking contests. 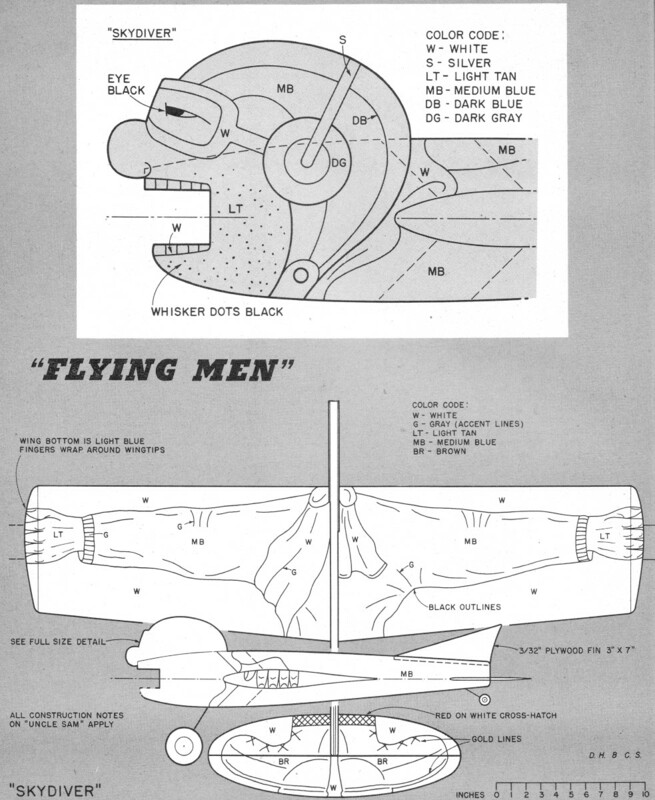 The Ringmaster is the basic part of each Flying Man shown here. Only a few changes are needed to modify the kit into these unique designs. First, the outline on the kit fuselage top should be carved off to make a smooth top profile. 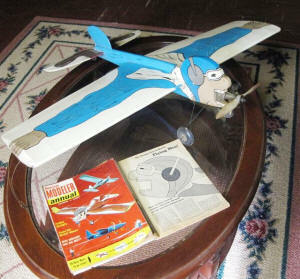 A new plywood doubler is added to make the face outline and a plywood fin is substituted for the balsa kit part. The stabilizer mounts in a slot in the fuselage tail level with the wing on the thrust line instead of on top of fuselage plank. A one ounce weight is added to the outer wingtip. The cutout for the engine is filled in to shorten the opening; 3/8" x 1/2" hardwood engine bearers are let into the fuselage plank between the plywood doublers. Nylon covering is used for durability and added strength. The Torp 29 is mounted with up to 15° off-set towards the outside of circle to help maintain tension on the flying wires. A 9D-6P Nylon prop is used and a 4-oz Perfect fuel tank is fitted. Landing gear can be stiffened by adding another vee from legs to engine mount area. The control system linkage should be set up so that greater than normal elevator travel is obtained. Elevator should move at least 70° both up and down (total 140°) to give the greater control needed for the extreme attitude changes of the model during flight. The only tricky part of the conversion is the doubler construction for the face at the nose. One regular kit doubler is installed on one side of the nose, the other side requires a new doubler. This is made of 3/32" birch plywood cut to both the outline of the nose section along the bottom and the full face and head outline. It is also made 1-1/2" longer than the kit doubler for added strength. The head space above the fuselage is filled with %" balsa sheet to the same profile as the new doubler. This construction detail and other pertinent data is shown on the "Uncle Sam" plan. This also applies to the other designs. The original "Uncle Sam" and "Skydiver" were rigged for clockwise flight to take advantage of torque as an aid to maintaining line tension. Since most stunt models are rigged just the opposite (counter-clockwise flight) these designs can be so rigged for flyers accustomed to the regular stunt flight direction. Randy Holland's Dennis-the-Menace rigged in standard fashion performs well. Slightly more thrust line offset may be needed. To achieve smooth hovering flight the model's weight must be just offset by engine thrust. The Ringmaster Torp 29 combination works very well, so don't try to change things around. It is a good idea to leave fuselage plank the full 1/2" thick along its entire length. Test fly the model after several coats of clear dope have been applied, then if any shaving to reduce the weight is needed it can be done without ruining a fancy paint job. You don't have to be a Rembrandt to duplicate the paint schemes shown in the drawings. Note that the various colors are coded and indicated on each drawing. Always apply the lightest colors first, so that any overlap of darker colors will cover easily. 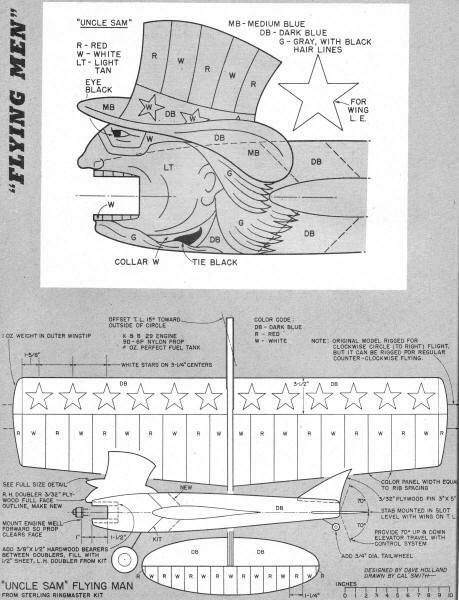 The "Uncle Sam" design will require the use of masking tape to achieve the straight lines. Stars along the wing leading edge can be cut from fuel-proof decal sheets and doped on. Face and hat detail can be painted on free-hand and will require careful workmanship. The hand-arm, scarf and coat detail on "Skydiver" and "Early Birdman" are best painted on free-hand and if a few extra wiggles develop in the process this will only add to the originality of your artistic efforts. 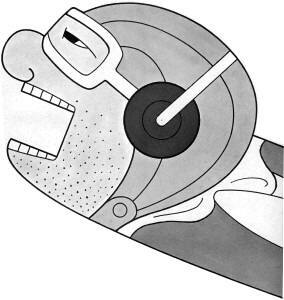 The outlines of all detail can be accented with a narrow black lines, in the best cartoon fashion. This will give the design better visibility when viewed from a distance. The "Early Birdman" (Oily Boidman) design shown on the cover offers a third possibility carrying Dave Holland's idea a bit further. We substituted a real cloth scarf for a painted-on one, and this makes the model self-wiping in flight. The real buttons on the sleeves should be about 3/4" dia. cemented well to covering. The gloved hands should have edges sanded to a half-round section (yes, there are only four fingers, a la the cartoon characters). 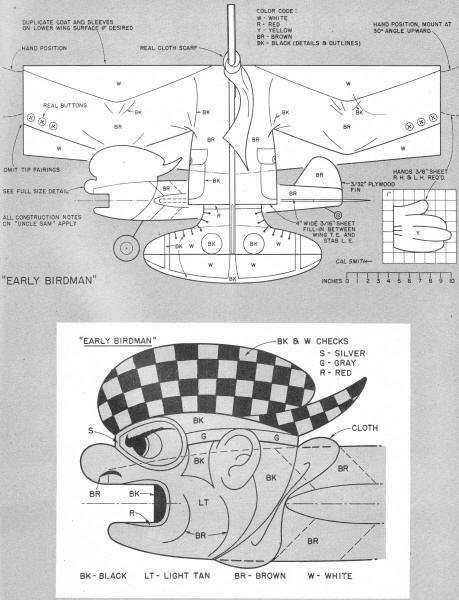 Note that the cover drawing shows coat tails and ankles mounted along the fuselage top. To simplify construction FOLLOW THE PLAN DRAWING... not the cover. With stabilizer mounted level with the wing, the space between wing trailing edge and stab leading edge is more easily filled with sheet balsa to make coat and ankle outline. The paint job then simply extends over wing surface onto sheet fill-in, then on back to stabilizer.